Nathan Hale delivered one of the most memorable lines in the history of the American Revolution. As a soldier for the Continental Army, Hale was captured during an intelligence operation in New York City. Upon the gallows, he allegedly stated “I only regret that I have but one life to give for my country.” Whether these words are verbatim or not, Hale is considered an American hero for his dedication to his country and willingness to make the ultimate sacrifice on behalf of his beliefs. 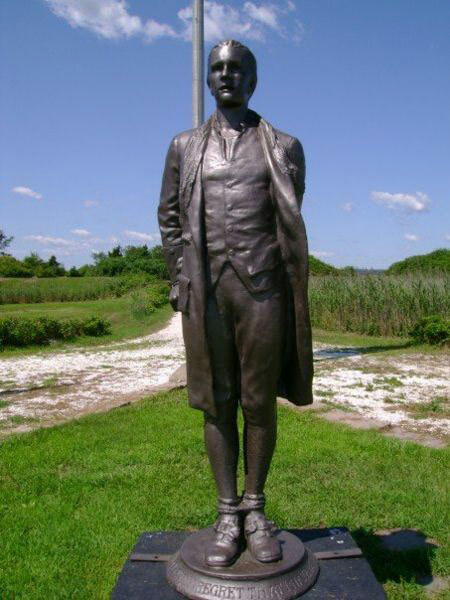 Nathan Hale was born the sixth child of twelve in Coventry, Connecticut on June 6, 1755. He grew up on his family’s prosperous farm until leaving to attend school at Yale 13 years later with his older brother. During his enrollment, Hale belonged to a literary fraternity, Linonia, which examined issues of the day such as the ethics of slavery and other academic topics such as astronomy, literature and mathematics. While at Yale, Hale met and studied with Benjamin Tallmadge, who would significantly influence his perceptions and decisions later in his life. Upon graduation in 1773, Hale became a schoolteacher in East Haddam followed by a posting in New London. During his tenure as a schoolteacher, Hale taught regular classes but also offered classes to young women of the town. During his college days, he often spoke on the inequality of education between men and women. When the Revolutionary War began in 1775, Hale joined the Connecticut militia and was elected first lieutenant. Despite his enlistment, rank and active service, Hale did not participate in military combat activities until 1776, although he spoke up on behalf of military action in community meetings. Following his unit’s participation in the Siege of Boston, Hale, who did not participate, received a letter from his former classmate, Tallmadge, on July 4, 1775. In this letter, Tallmadge encouraged Hale to become an active militia member. Due to the inspiring nature of the letter, Hale accepted a commission as first lieutenant in a regiment stationed in Stamford, Connecticut under the command of Colonel Charles Webb. Upon his enlistment, Hale’s regiment was stationed in New London before being ordered to Cambridge. In Cambridge, the regiment was attached to the left wing of the army commanded by General George Washington on September 14, 1775. Camping at the foot of Winter Hill, this portion of Washington’s army commanded the route from Charlestown, which was one of only two roads the British could use to exit Boston. On January 30, 1776, Hale’s regiment was moved to the right wing in Roxbury where they participated in successful actions in March to drive British troops out of Boston. In the spring of 1776, the Continental Army moved forces to Manhattan to prevent the British from taking control of New York City. Hale’s regiment was one of the units assigned to this effort under the command of Washington. Washington sought a volunteer to go behind British lines and discover the location of the planned invasion. Hale, seeing the assignment as a patriotic opportunity, volunteered on September 8, 1776. A few days later on September 12, Hale crossed enemy lines disguised as a Dutch schoolteacher, immediately placing his life at risk. As an enemy spy, his life was forfeit should he be caught by British forces. New York City fell on September 15 to British forces and Washington’s troops retreated to Manhattan Island’s north end. Hale remained in the British occupied southern tip of the island. On September 21, the Great New York Fire of 1776 destroyed a quarter of the lower portion of Manhattan. After the fire, nearly 200 American partisans were arrested by the British. At the same time, Hale was caught in Flushing Bay near Queens, New York as he awaited his planned escape rendezvous. Upon capture, he was transported under heavy guard to British headquarters in New York. Accounts of the time indicate Hale was questioned by British General William Howe after his capture and that physical evidence was found on his person incriminating him as a spy. According to historical records, papers were discovered in Hale’s shoes detailed the information he had gathered, including sketches of British fortifications and notations of numbers and positions. Captured spies faced execution by hanging if they were found guilty of espionage activities by military judgment. Wartime standards did not require a formal trial for suspected spies. While awaiting execution overnight, Hale requested a Bible and a visit from a clergyman, but both requests were denied. Records indicate he also requested writing materials and penned two personal letters, which were destroyed after his death. On the morning of September 22, 1776, Hale faced his own execution. He was marched along Post Road to the Park of Artillery where the gallows waited. According to witness accounts and records of his execution, Hale spoke eloquently before his execution. According to many accounts, Hale stated “I only regret that I have but one life to give for my country.” After uttering his final words, Hale was hanged as punishment for spying. The validity of Hale’s final words remains in question. While some accounts refer to his eloquence before his execution, the actual quote attributed to him comes from a secondary source. John Montresor, a British soldier who witnessed the execution, reportedly repeated Hale’s words to William Hull, an American officer. Hull then publicized Hale’s statement throughout the colonies. It served as inspiration to many and epitomized the dedication of many patriots of the time. Whether the famous quote is verbatim and accurate or not, Hale’s final moments conveyed the dedication he felt towards the quest for independence. While Nathan Hale died at the early age of 21, his words resonated across the revolutionary efforts and throughout history. His passion and commitment to the cause of independence inspired many of his compatriots and served to motivate many others. Hale did not participate in many military actions during his brief military tenure, but willingness to take on a dangerous mission and his bravery in the face of execution earned him a place in American history as a martyred hero of the American Revolution. i love this guy he was the best of the best! little do you know, I’m sitting here 3 years later thinking “who says YOLO”? what are his parent’s names?! plz answeras soon as posible. and thx for all the great info! 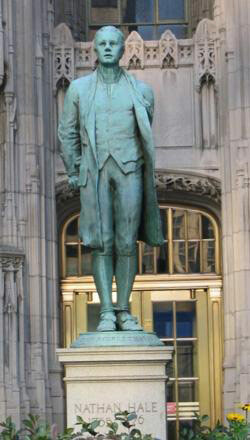 I think that Nathan Hale was a very brave and noble person, but he was also a little careless. He should ave been more careful (in my opinion). But anyway…very brave, noble, and overall an amazing human being. Oh, and great bio on him. Very detailed and great for facts. Thank you! It totally helped!!!!! THANK YOU!! THIS TOTALLY HELPED ME DO MY SOCIAL STUDIES PROJECT!! !